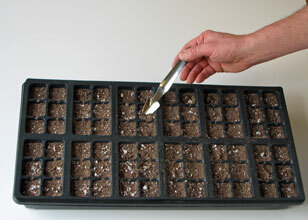 I prefer to use seed trays, but you can start seeds in any container as long as it has drainage. The containers, whether bottoms of waxed milk cartons, paper cups, seed flats or individual containers, should be about two to three inches deep. Seed flats are plastic trays molded into individual cells--one per seedling after thinning. Many of the available trays you'll find include a clear plastic cover for the purpose of keeping the soil from drying out. The best trays are insulated with built-in water reservoirs and capillary matting. Regular trays or any flat container will work, but dry out more quickly than plastic covered trays. If you're growing tomatoes from seed using more than one variety don't forget to insert labels next to each tomato variety. If some do better than others, you'll want to know which were the successful ones! Note the variety and the planting date on the label. I like to use clear plastic three- or four-inch labels to avoid shadows, or white labels like those shown. This package comes with a special marking pencil. You can also use an industrial Sharpie or other permanent marking pen that won't fade in the sun. I have two favorite sources for seed germinating supplies. Burpee, the well-known seed company, not surprisingly sells seed flats and other related equipment in addition to seeds. Items include the Burpee Ultimate Growing System , a 72-cell seed tray that also includes a wicking mat, clear plastic top, soil blocks, and labels. They also carry a seedling tray heat mat that has received good customer reviews. Another company is Gardener's Supply Company. Like Burpee, they show actual customer comments on all their products. They have a kit called the APS Starter Kit which includes everything you need to start seeds indoors, including two self-watering 24-cell trays, two greenhouse covers for faster germination, 9 quarts of germinating mix, 24 wooden seedling markers, two water-level indicators, and fertilizer for seedlings.